What's football without a snack? 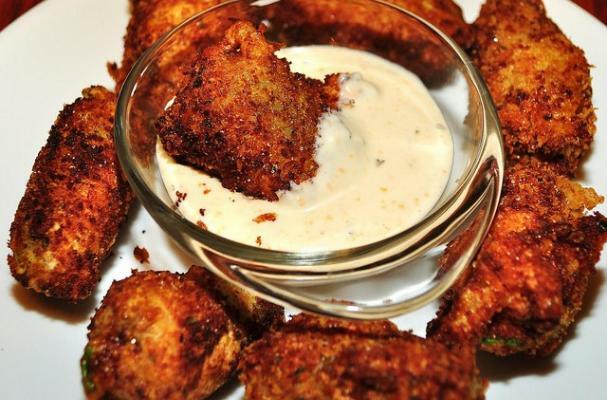 For tonight's game try your hand at making your own jalapeno poppers. These poppers are tastier than the frozen variety and a bit healthier too (they are baked instead of fried). Cream cheese is combined with cheddar cheese, spices and sausage before being stuffed into the jalapenos. Each jalapeno is then dipped into a seasoned egg mixture and dredged in panko bread crumbs (Japanese bread crumbs) before being baked. Serve these cheesy jalapeno poppers with your favorite dipping sauce. In a bowl, cream together the cream cheese, Cheddar cheese, cumin, and cayenne. Add the cooled cooked sausage and mix. In a small bowl, beat together the eggs, milk, and 2 teaspoons of the Essence. In a shallow dish, combine the panko crumbs and remaining 4 teaspoons of Essence. In a third dish, combine the flour and remaining 2 teaspoons of Essence. Spread 1 tablespoon of the cheese mixture into the middle of each jalapeno half. One at a time, dredge in the flour, dip into the egg mixture, then dredge in the panko crumbs, pressing to coat. If necessary, repeat the process. Place the coated peppers, cut side up, on the prepared baking sheet and bake until the filling is runny and the crust is golden, about 30 minutes.